MAX High-Back Pneumatic Tilter from Global. The Max High-Back Pneumatic Tilter chair has ergonomic elements that include tension adjustment, seat height adjustment, contoured cushions, center tilt and a waterfall seat edge, allowing you to avoid muscle fatigue and increase blood flow. The base comes in Tungsten or black, and fabric in burgundy, black or charcoal. Both comfortable and classic, this high back office chair fits into any contemporary executive setting. 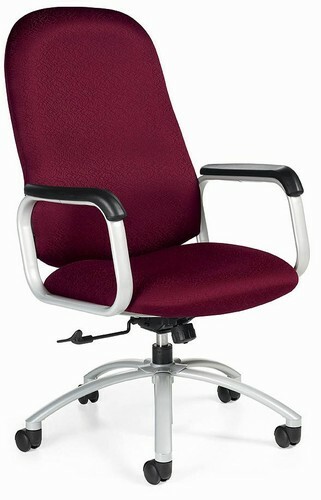 MANY ergonomic features such as: TENSION ADJUSTMENT- Increase or decrease to match body weight. Allows you to rock comfortably, without heavy pushing, reducing muscle fatigue. CHAIR TILT LOCK- Lock the tilt movement in position(s) to accommodate your working posture. Allows you to lock your chair in a comfortable and supportive position. (can be either single position or infinite style). SEAT HEIGHT- Raise or lower to allow your feet to rest flat on the floor. Avoids pressure under your thighs, easing blood flow. WATERFALL SEAT EDGE- Reduces pressure at the back of the knee, contributing to good blood flow. PROPERLY CONTOURED CUSHIONS- Support the body effectively, allowing you to sit longer without discomfort. CENTER-TILT MOVEMENT- Chair tilts from a pivot point under the center of the seat allowing you to rock. When your feet are well supported, blood flow is enhanced.